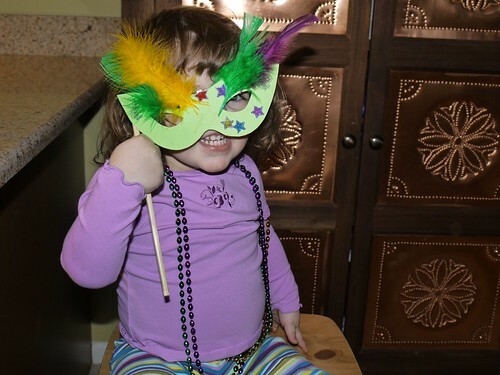 Molly and I hosted a Mardi Gras playdate today. I was given a boxed king cake mix, and finally had a reason to make it. After the baking was complete, I resolved to leaving the bread making to my mom. Kneading dough is a mess! 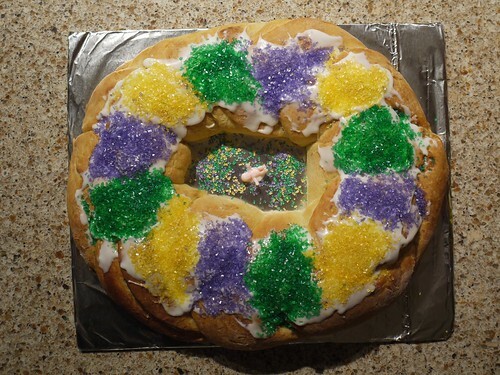 But, the king cake turned out well. Molly wanted to wear all of the sparkly necklaces before her friends came over. She wore at least one bead all day, and cried when they had to come off for nap time and her bath. She made sure that Daddy and I were appropriately adorned too. In addition to playing Mardi Gras music, and eating king cake, we had a mask-making craft for all the kids. I intended to take pictures during the craft, but I had to attend to my own crafter. I was lucky to get Molly to hold her mask like Daddy's glasses for a quick pic. On a side note, as I was preparing pizza for dinner tonight, Chad asked Molly if she liked pizza, and she quickly responded, "I love pizza!" It was so funny to hear her say that. She is doing very well with her words and sentences. The front page is now a blog. Feel free to subscribe to the RSS feed and keep up with what's going on. 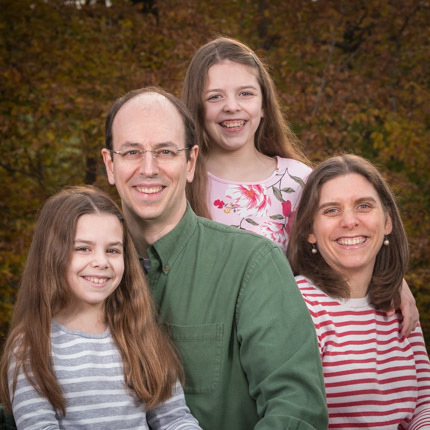 You'll see posts from Jen, Molly, and me (though probably mostly from Jen) to keep you up to date on what's going on. You can also, of course, comment on our posts, so the new site is much more interactive. Our videos can still be found here. Each video is just a post to the blog, so they'll show up just like another blog post. If you want to see older videos, just click on the Video Category on the right. We hope you enjoy the new site. Let us know what you think.